Pride Road Architects offers a bespoke architect service that works around you. What’s important to us is getting to the heart of your project, which is why you can expect to be a part of our four-stage process from the outset when you book a workshop with us. Here we’ll get to know you and understand your needs. 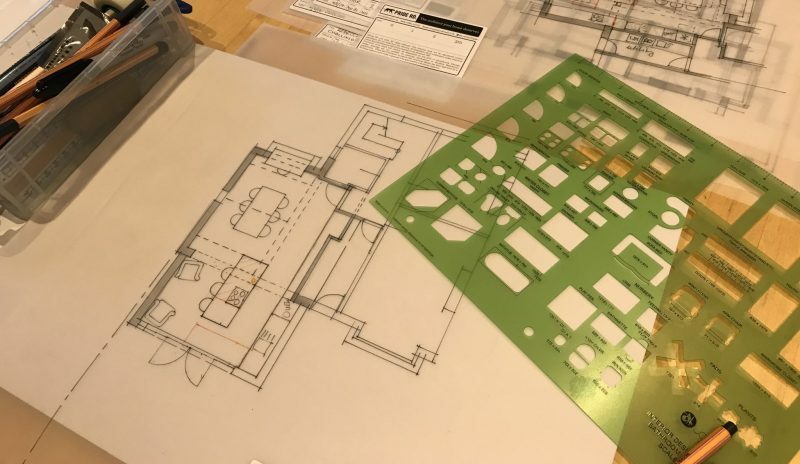 Once you’ve booked in a workshop, we’ll have an architect come and spend a day or so (depending on the size of the project) at your home, working on finding the right options for you. This begins with us asking questions about how you use your home and what’s important to you about the changes you want to make. And as long as you can provide us with a table, a chair (and the odd cup of tea), we’ll flesh out some ideas and do the drawings right there in front of you. We’ve helped so many people already, we are sure we can be of value to you. We find that by doing this, the architect can really get a deep understanding of the property and talk you through our recommendations easily. It also means we can do things like take measurements and really get a feel for the place. Once some decisions are made, we can start to look at the feasibility of the plans and see if there are any potential issues. We’ll take the drawings to a quantity surveyor and computerize the designs (though not in 3D) and look at next steps. For many people, planning applications and the associated legal issues can be a real cause of anxiety. But during the planning phase, we can be as involved as you like and help guide you through it all. Not only will we talk you through the planning application itself, we’ll provide a risk assessment so you know what things might come up. We can advise on materials, register the application and help you respond if, for whatever reason, the application is rejected – walking you through another application if need be. FAQ: Do I need planning permission for my extension? FAQ: When does planning permission apply? There are a whole host of things to consider at this stage in the process, some of which you may not be familiar with or may not even have been expecting to come up. These can range from things like waterproofing, foundation, ventilation and boiler safety regulations, to more general health and safety legislation relating to fire escapes, exit routes and staircase regulations. We’ll talk you through of all of this so are confident your project is all legal and compliant, and once again there isn’t a question you can raise that we probably haven’t been asked before! Once you are happy with the design and how it will work for you, and all the feasibility, planning and regulatory boxes have been ticked, you’ll need to take the next step of finding the right builders for your project. Of course, we understand you may already have someone in mind, but if you have yet to find someone you can trust with the job we have builders, contractors and quantity surveyors we can recommend. These are people we know will be able to continue bringing your dream home to life and will care about your project just as much as we do. For more info on the practical steps involved in designing your dream home, as well as inspirational design stories, sign up for our email newsletter. Or better still, if you want to chat to someone, this is the time to let us know!